My husband and I were at the beach recently and enjoyed lunch at a seaside restaurant. I had my usual Caesar Salad with Grilled Shrimp, but my husband had the daily special which was Salmon on Field Greens with Berries. I thought I wouldn’t like a combination of salmon and berries, but as soon as my husband gave me a taste of the salad I knew I had to replicate it at home. We bought a huge side of salmon at Costco recently that I had cut up into 6 ounce portions and froze so I was already half way there. 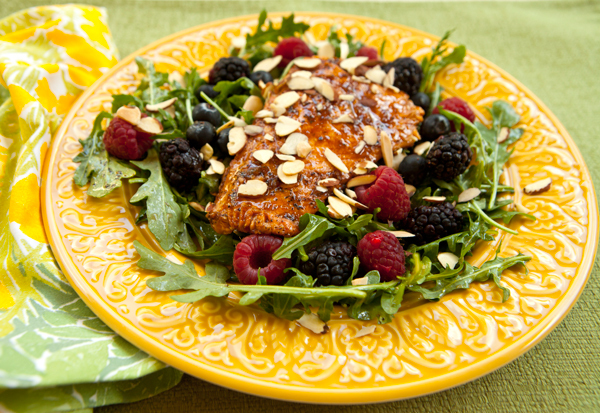 I grilled my salmon with a glaze of pomegranate molasses to add a touch of sweetness, then served it on a bed of dressed greens with lots of fresh berries. It was delicious, and in fact it was so tasty we’ve enjoyed the salad three more times over the past few weeks! If at all possible, choose wild caught salmon for the most health benefits. Berries are rich in flavonoids that help counter cell damage reducing the risk of cancer and cardiovascular disease. As well, berries contain important antioxidants that help reduce inflammation. For the dressing, whisk together the oil, vinegar, lemon juice, salt and pepper. When the grill is heated, oil the grates. Pat the salmon fillets dry, lighten rub with olive oil, and season with salt and pepper. Transfer the fillets to the grill, and let cook about 3-4 minutes, then flip carefully and brush with the pomegranate molasses. Continue cooking until the salmon is nicely browned outside and just cooked through inside, about 3-4 minutes more. Remove the salmon to a plate and let cool. In a large bowl, toss the mixed greens and onions with a few spoonfuls of the dressing, adding more to taste if needed. Divide the greens onto four serving plates. 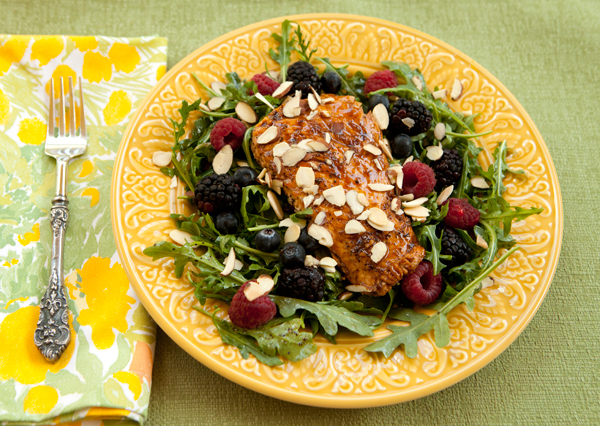 Add a salmon fillet to each bed of greens, then top each salad with a sprinkling of the toasted almonds and berries.